(CNN) -- The past is new again for agent 007: The next James Bond film will be called "Spectre." 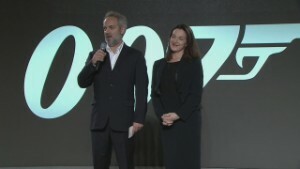 Director Sam Mendes announced the name of the 24th official Bond film Thursday at England's Pinewood Studios. Austrian actor Christoph Waltz will join Daniel Craig in the cast. Craig makes his fourth appearance as the rugged British secret service agent. Ralph Fiennes, Rory Kinnear, Naomie Harris and Ben Whishaw will be reprising their roles from 2012's "Skyfall." Newcomers to the franchise include Monica Bellucci, Lea Seydoux, Andrew Scott and Dave Bautista. Shooting for the film, due for release in late 2015, begins Monday. Mendes all but said the title was a nod to the SPECTRE terror group featured in Ian Fleming's James Bond novels and the early films. "Those of you who have some knowledge of the Bond franchise and the legend of Bond will probably have some idea of what that refers to, but I couldn't possibly comment," Mendes said. The film's official Twitter account featured a picture of Bond's new car, a snazzy Aston Martin DB10. Rome, London, Mexico City, the Austrian Alps and Morocco will serve as some of the film's exotic locations. A new James Bond novel, "Solo," debuted in October. It was written by novelist William Boyd, who was handpicked by Ian Fleming's estate to write it. The new James Bond novel, "Solo," has just been published with the opening scene coming courtesy London's Dorchester hotel. We all love James Bond car chases. But how do they stack up when you look at them with the cold eye of reality? CNN Neil Curry looks back at the memorable action scenes that have defined the Bond franchise. Live like 007 with this epic itinerary across Europe that traces Bond's greatest hits. Futuristic gadgets, villains and evil temptresses not included. The James Bond theme is one of the most famous pieces of music in cinematic history. CNN's Neil Curry meets its makers. Do Bond movies predict the world? Be it the Cuban missile crisis or the Apollo disaster, the "James Bond" films have been eerily accurate in predicting world events for fifty years. Browse through the historical images of James Bond and his creators to see the best momets from the movies and behind the scenes. John Cork, a renowned James Bond expert, reveals to Showbiz Tonight what makes the best Bond, Bond girl, Bond movie. But which is it? We love Bond films for many reasons: the handsome men and beautiful women, the cool gadgets, the amazing chases. And, of course, the travel tips. Beatles and Bond: Can we let them be? Friday's double anniversary of Bond premiere and release of Beatles' debut single offers a chance to wallow in nostalgia. But is it time to let them be? Just how much would you pay for a piece of James Bond's history? Neil Curry looks at an auction of Bond memorabilia to mark Global Bond Day. Sharp Tea Tray, Revolving Sofa, Moonraker Laser Gun, Radio Transceiver Broom... How much do you know about 007's essential gadgets? Sit back, relax and fix yourself a martini - shaken, not stirred - as we present to you the "Connoisseurs Guide to James Bond's best moments."